Educational tests and measurements; United States. Early childhood education; United States; Evaluation. Child development; United States; Testing. Note: This is the bound book only and does not include access to the Enhanced Pearson eText. To order the Enhanced Pearson eText packaged with a bound book, use ISBN 0133831558. 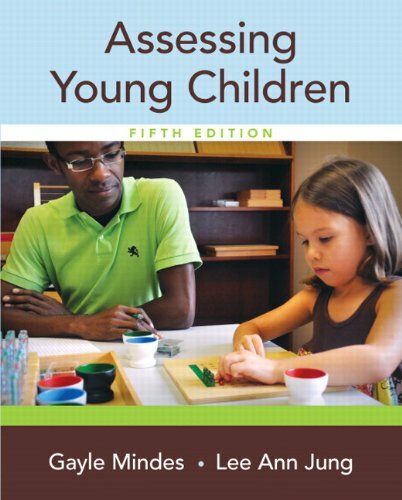 Assessing Young Children, 5/e by Mindes and Yung is the ideal resource for pre- and in-service teachers with a need to understand the broad range of assessment issues in early childhood and to deliver an effective educational program for all young children from birth through age eight. Grounded in research-based and recommended practices, it prepares teachers to assess young children in a variety of settings, including inclusive environments, blending early childhood and early childhood special education. Students learn about assessment practices from observation to the complexities of referring children for special education or early intervention evaluation. The focus throughout is on working with interdisciplinary teams to serve a diverse population of children. The new Fifth Edition features a Ã¢ÂÂCultural ConnectionsÃ¢ÂÂ section in each chapter clarifying applications of the topic with children from diverse cultural backgrounds. Particular attention is paid to English learners. The Enhanced Pearson eText features embedded video and internet resources. Engaging.ÃÂ The new interactive, multimedia learning features were developed by the authors and other subject-matter experts to deepen and enrich the learning experience. Affordable.ÃÂ TheÃÂ Enhanced PearsonÃÂ eText may be purchased stand-alone or with a loose-leaf version of the text for 40-65% less than a print bound book. *The Pearson eText App is available on Google Play and in the App Store. It requires Android OS 3.1-4, a 7Ã¢ÂÂ or 10Ã¢ÂÂ tablet, or iPad iOS 5.0 or later. About: Note: This is the loose-leaf version of Assessing Young Children and does not include access to the Enhanced Pearson eText.